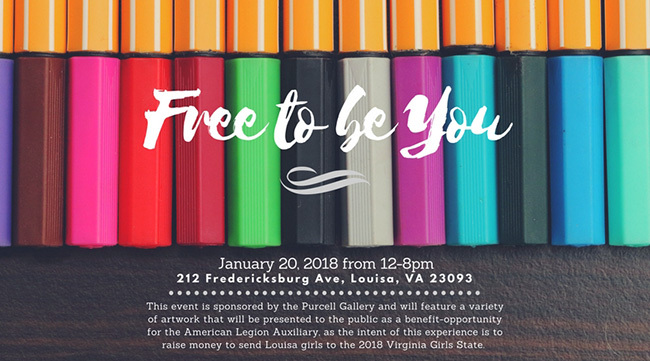 Past “Free to be You” group benefit exhibition at the Louisa Arts Center on Saturday, January 20, 2018 12-8pm in Louisa, VA. The Purcell Gallery at the Louisa Arts Center hosted “Free to be You,” an art show with a community cause featuring donated works by Artist’s from across the Country. 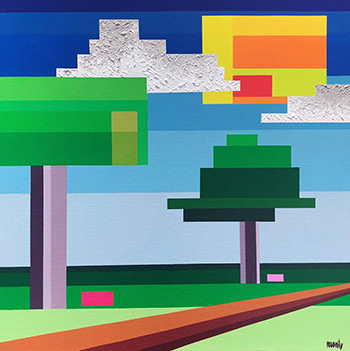 This exhibition is part of the student’s blue Ridge Virtual Governor’s School (BRVGS) Senior project and is curated by high school senior, Kat Loewenstein. The event functions as a benefit-opportunity for the Louisa faction of the American Legion Auxiliary (ALA). The overall purpose of this exhibit was to raise money so that the Louisa ALA can send more juniors to the 2018 Virginia Girls State, as last year the group was only able to send three girls in total. I was honored to be included in this exhibit and to donate “Moment #12″ 18″ x 18″ x 1.5” hand embellished, archival pigment print to this wonderful cause in my home town! Thank you to my dear friends Randy and Cricket Edmonson, Pam Butler, and Stephanie Arner for also donating their beautiful works for this event. Kat decided the best “thank you” she could give the ALA for their kindness was an event that collected resources to do just that. Due to Kat’s personal passion for photography, painting, and creative writing, she decided to create and execute a show that would serve as a charity to help those in her community. Therefore, the overall goal of this art show is to raise $900+ to send at least three girls to the 2018 Virginia Girls State, a “thank you” that will allow all future delegates and featured artists the freedom to be themselves.